Music and history come together with the Concerts in Mozart’s House, offering eager listeners the chance to enjoy a programme of 18th century classical compositions in one of Wolfgang Amadeus Mozart’s former residences. Performed within the Monastery of the German Teutonic Order, this centuries-old building was occupied by Mozart in the year 1781, during his work for Prince-Archbishop Colloredo of Salzburg, one of the key sponsors of the Mozart family. 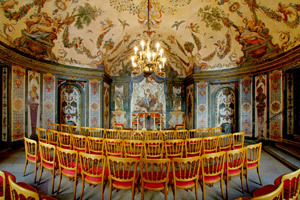 These concerts take place within the monastery’s Sala Terrena, Vienna’s oldest concert hall and a frequent venue for Mozart’s own performances. This ornate hall is decorated with numerous elaborate frescos, drawing from the style of the late Venetian Renaissance and embodying the Baroque lifestyle with its various adornments and depictions of scenes from classical mythology. The Concerts in Mozart’s House are performed by the Mozart Ensemble - Vienna, a professional, experienced and well-balanced string quartet that strives to continue Vienna’s great musical heritage through their performances in this historic venue. In keeping with the Baroque atmosphere of the Sala Terrena, the ensemble performs in full traditional dress reminiscent of the costumes worn within Mozart’s lifetime, adding to the authenticity of the experience. Having performed both within and outside of Austria, the Mozart Ensemble - Vienna has established a solid reputation for its concerts, drawing visitors from across the globe. The program itself features a selection of well-known compositions that celebrates the chamber music life in Vienna with composers including Wolfgang Amadeus Mozart, Franz Schubert and Joseph Haydn. Be sure not to miss this opportunity to fully experience a slice of 18th century Viennese culture through the Concerts in Mozart's House.